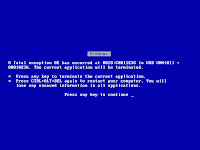 Everybody knows the infamous Windows Blue Screen error or the simple but obvious call to action "Abort, Retry, Ignore". They both have plagued our computing lives for nearly 30 years. One would think that with advances in software development, in the age of Web 2.0, such critical systems as Windows Vista would become legacy for those gray haired computer geeks like me. Well, I guess not! How subtle of Microsoft engineers to remind us of a piece of legacy. In the snapshot taken this morning, there is some comfort in the sample but very efficient error message: "Problem Event Name: BlueScreen"! Almost like comfort food for the mind. At least, now we can "Check for solution", which, of course, doesn't solve our issue but makes us feel more empowered and satisfy our inner instincts of being in control. (Note: I tried "check for solution" without success, than canceled and Vista continued smoothly).